Continuing our series of recipes that perfectly pair our beers with food, this one kicks up the sweet and savory pleasures. 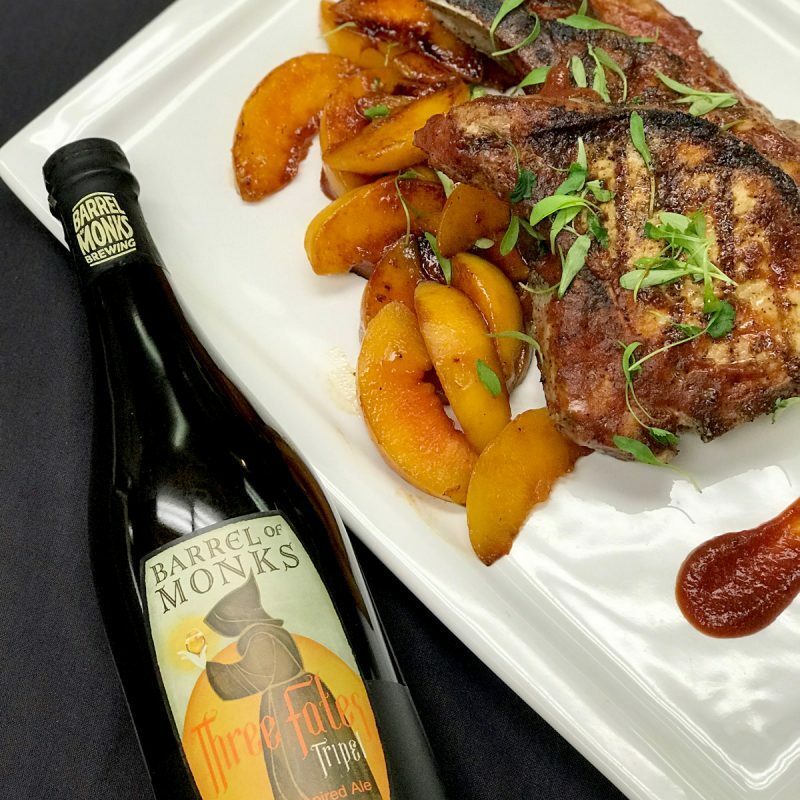 A juicy pork chop grilled and paired with a BBQ sauce containing a couple cups of our Three Fates and finished with some warmed peaches. Pick up some of our Three Fates Belgian Style Tripel, drink a bit, and cook up some chops tonight. Place the pork chops in one large zip lock bag. Mix all the ingredients in a bowl and then pour into the zip lock, seal and marinate in fridge for at least 2 hours up to 8 hours. Remove from marinade before they are grilled and bring to room temperature. Grill over medium heat until internal temperature has reach 140-145 degrees. The last 5 min of cooking spread on bbq sauce (recipe above) and glaze the chops. Let rest for 5 min. Add all ingredients into a heavy bottom pot and cook over low heat till thick, at lest 25-30 min, cool and use when ready. Put all the peaches in a large bowl. Add all the other ingredients and toss until well coated and let sit while the pork chops are cooking. Once pork chops are resting, place on grill and grill each side for 3 min, then place on a sheet pan until ready. Cut the peaches into 1/4 and place on plate with pork chop and drizzle with the Three Fates BBQ sauce. Serve with a generous amount of cilantro sprinkled over.